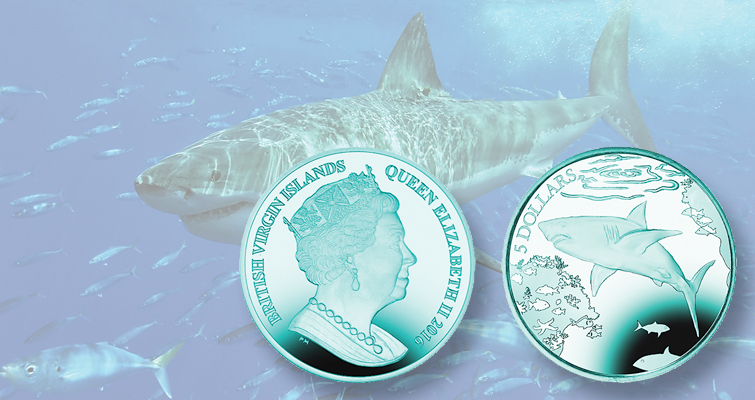 The Pobjoy Mint’s newest colorful titanium coin, issued on behalf of the British Virgin Islands government, features the powerful great white shark. In addition to the turquoise titanium $5 coin, an Uncirculated copper-nickel dollar and a Proof .925 fine silver $5 coin with the design are also available. The Great White Shark is getting the Titanium treatment from the Pobjoy Mint. The great white shark (Carcharodon carcharias) is a species of large shark that can be found in the coastal waters of all the major oceans. Great white sharks are estimated to live as long as 70 years or more. The great white shark has no natural predators other than the orca and is one of the primary predators of marine mammals. A great white has a white underside and a gray dorsal area. This coloration makes the shark difficult for prey to spot, because it breaks up the shark’s outline when seen from the side. From above, the darker shade blends with the sea, and from below, the shark’s silhouette against the sunlight is minimized. 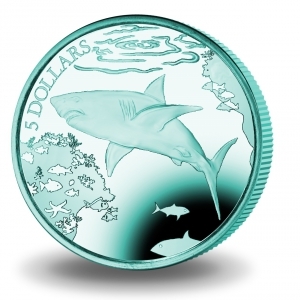 The reverse of the coins shows an underwater scene with a central image of a great white shark. The obverses carry an effigy of Queen Elizabeth II exclusive to the Pobjoy Mint. Titanium is exceptionally difficult to strike and, because of the way the colored titanium reacts when striking, no titanium coin is exactly like another. A lined effect also present on the coins is unique to this metal. MEASUREMENTS - 36.1 millimeters in diameter. Also Available are Copper Nickel and Silver Proof Versions - The Uncirculated copper-nickel dollar and Proof silver $10 coin each weigh 28.28 grams and measure 38.6 millimeters in diameter. The $1 coin has unlimited mintage and retails for $16.95. The $10 coin is limited to a mintage of 10,000 pieces and retails for $65.